A beautiful Detached Barn Conversion with extensive and versatile accommodation arranged over Two Floors and standing on a truly wonderful plot extending to approximately 1.38 acres plus additional Woodland rolling down towards the Bollin Valley. 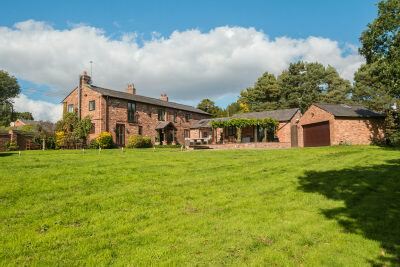 As such, the property enjoys a delightful, secluded semi rural location yet at the same time is within easy reach of Hale Barns Centre and the Motorway networks serving the region. Without doubt, the most impressive feature of the property is the truly wonderful Garden which is laid almost entirely to an incredible expanse of lawn, bordered by substantial mature trees to all sides, creating complete privacy and providing a delightful outlook. The house itself has been designed to ensure that all Principal rooms enjoys the aspects across the Gardens with French doors leading from the Reception Rooms onto a stone paved, South facing terrace overlooking the Gardens. The property has a wealth of character features associated with a Barn Conversion, including rustic brick elevations under a slate pitched roof and has a wealth of exposed internal beams and substantial timber A frames, creating vaulted ceilings to the First Floor. The family accommodation provides a spacious Lounge to the Ground Floor in addition to a fabulous Open Plan Family Living, Dining Room and Breakfast Kitchen, creating an ideal day to day informal family living format. There are Five Bedrooms served by Three Bathrooms including a Ground Floor Guest Bedroom Suite. Pillared Porch to the entrance door to the Hall with modern wood laminate flooring throughout, exposed timber beams to the ceiling, extensive halogen lighting, a spindle balustrade staircase rising to the Galleried Landing and having an understairs cloaks and storage cupboard. Well appointed Ground Floor WC with white suite, chrome fittings, halogen lighting and laminate flooring. Lounge with wood laminate flooring, natural light via windows to three sides and having French doors giving access to and enjoying a fabulous aspect of the Gardens. There are exposed timber beams to the ceiling, an exposed brick fireplace with substantial timber mantle and stone hearth and extensive chrome halogen lighting. Fabulous Family Living and Dining Room with exposed timber beams to the ceiling and modern wood flooring, and with French doors opening onto the terrace to the front and additional windows to the side elevation. This room is entirely Open Plan in design to the Breakfast Kitchen, again with French doors and windows giving access to the terrace with a wonderful view of the Gardens beyond and having a high vaulted beamed ceiling with three inset double glazed Velux skylight windows. The Kitchen is fitted with a range of high specification, high gloss finish units with Silestone worktops over, arranged around a central Island unit incorporating a Breakfast Bar. Sink unit inset into the Island. Integrated stainless steel appliances include an oven, combination microwave oven, coffee machine, halogen hob with extractor fan over and integrated fridge, freezer and dishwasher. A door leads through to an Inner Lobby with a further door to the Utility Room with plumbing for washing machine, space for a dryer and a built in sink unit with a further door providing outside access. A further door off the Inner Lobby leads to a delightful Guest or Principal Bedroom with modern wood laminate flooring and French doors with full height side windows giving access to and enjoying an aspect of the Gardens. This Bedroom is served by a well appointed En Suite Bathroom with a white suite with chrome fittings, providing a full bath with curved shower end and shower screen, wash hand basin and WC, white ceramic tiling to the full height of the walls and chrome finish halogen lighting. From the Hall a staircase leads to the First Floor Galleried Landing which is divided into two sections, with the main portion featuring an 11' vaulted ceiling with substantial, exposed timber A frames and two Velux skylight windows providing much natural light. Panelled doors lead to Four further Bedrooms, a Family Bathroom and a large walk in airing cupboard housing the pressurised hot water system. The Principal Bedroom is a beautifully proportioned room with much natural light via five window to three elevations including French doors onto a Juliette Balcony overlooking the Gardens. Again the room features a wonderful 11' high vaulted ceiling with exposed timber A frames and there is an exposed brick fireplace with open grate fire and stone hearth. There is an exposed brick feature wall and modern wood laminate flooring. A particular feature of the room is the freestanding tub bath with chrome pillar mixer taps. This room is further served by an En Suite Shower Room fitted with a white suite with chrome fittings, providing an enclosed shower cubicle, WC and wash hand basin. Halogen lighting. There are Three further Bedrooms at this level, Bedroom Three with exposed timber beams and two windows including a skylight window and a door leading to an external staircase providing external access. Bedroom Four has views over the Gardens and an extensive range of modern, built in wardrobes, storage cupboards and drawers and featuring a substantial, exposed timber A frame. The Fifth Bedroom with timber beaming to the ceiling, a window overlooking the Gardens and again with an extensive range of modern built in wardrobes, storage cupboards and drawers. The Bedrooms are further served by a Family Bathroom, superbly styled and refitted with a white suite with chrome fittings, providing a double ended bath with tiled surround, wall hung WC and wash hand basin with toiletry cupboard below and plate glass vanity mirror above, open wet room style shower area with drench shower head and plate glass shower screen. Extensive tiling to the walls and floor. Window to the rear. Chrome ladder radiator. Halogen lighting. 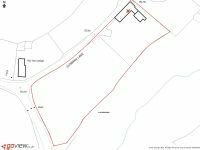 Externally, the property is approached via a five bar Farmyard Gate set within reclaimed brick walling to a Driveway returning to a Parking Area across the whole of the front of the property for a large number of vehicles. The Driveway in turn leads to the Detached, brick built Garage with electrically operated 'up and over' door. The Gardens are without doubt the most exciting feature of the property. The very nature of the Barn Conversion is that the property is positioned in the farthest corner of the plot with elevations bordering Sunbank Lane and as such this means that all of the Garden lies to the South of the property. As such, the house and Gardens enjoy sun from morning until night. The Gardens are laid almost entirely to lawn with a separate gate providing potential vehicle access at the farthest point. The Garden is literally pretty much the size of a football pitch, ideal for football mad boys (and girls!) 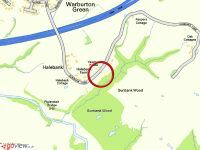 In addition, the property enjoys ownership to 2 acres of woodland set within Bollin Valley, perfect for adventurous children. 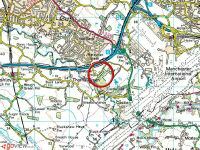 This really is a wonderful opportunity to acquire a quite unique family house with the sort of outside space you will not be able to find anywhere else in the area for the money.